Focus on having a good time when playing golf with your boss. Playing golf with your boss can be an important professional bonding experience. A casual game allows you the opportunity to interact with your boss outside the workplace, especially if it is just the two of you playing. However, you can also waste the opportunity for friendly chit-chat if the game turns into a heated battle. There simply are no hard and fast rules about losing to your boss in golf. The issue is not covered by the rules of golf etiquette, and every situation is different. How competitive to be is colored by a number of factors, including your boss’ personality. "Golf Digest" recommends playing hard against your boss and trying to win to show your competitiveness. That strategy works well if your boss is as competitive on the golf course as he is at work. If your boss is a lousy golfer and plays only for fun, then you should still feel free to play hard and even win. A boss who loves golf likely will respect your playing ability even if you win. Allow your boss to set the tone for the game. If your he invites you to his country club and includes two other players, then you absolutely should play your best. On the other hand, if the boss invites you for just a recreational round, then you should approach it that way and not focus so much on winning. Let your boss suggest the format for the game, according to "Golf Digest." The boss may suggest standard stroke play with individual handicaps used to determine the winner. Or she might suggest a really casual format such as a scramble, which does not require individual scores. Travis Fulton, a PGA-certified golf instructor, suggests in an interview with CBS News simply focusing on creating a fun, relaxed atmosphere that forges a professional bond with your boss. He says having a fun outing trumps winning or losing. Although you should try to bond with your boss on the course, don't use a golf outing as a chance for a Q&A session about work. Your boss may simply have invited you to play golf to get to know you better. Follow your boss’ lead; talk about work only if the boss brings it up. 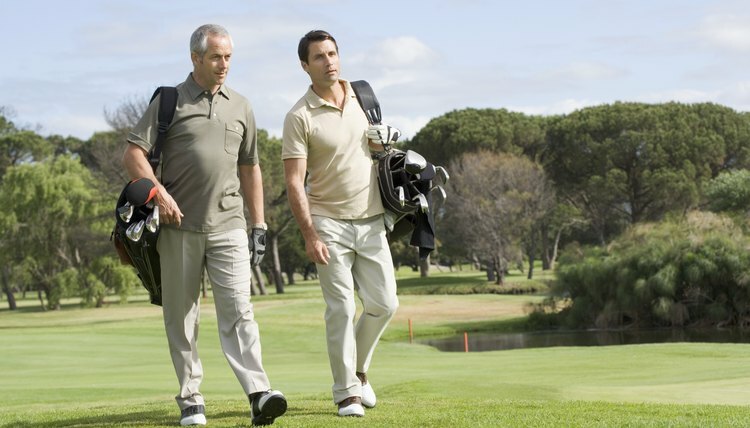 Follow the rules of golf etiquette even if your boss or others in your group do not. Know when it's your turn to hit a shot, don't walk across another player’s putting line and don't take too long to hit your shots. If you drink on the course, limit yourself to one beer or a mixed drink. Avoid getting drunk, even if your boss keeps urging you to drink more. Remember to dress appropriately for the course. Call ahead and ask about the dress code if necessary.